My sourdough bread baking journey began over 2 years ago. Finally I’ve arrived. Motivated by digestive issues that necessitated the exclusion of all bread except slowly fermented sourdough spelt from my diet, I began questioning bakers I came across in the blogging world about their experience. Many had dabbled combining spelt into their conventional wheat flour loaves but none had done a total switch to spelt flour. Their responses were sprinkled with doubt and caution. I was advised that the bread would be dense, the loaves wouldn’t rise much, the dough needed to be super wet, the starter would be sluggish, and so on. I took it all on board and ploughed on regardless. I found a 100% spelt bread recipe, unfortunately loaded with jargon, and beetled on for a few months accepting my brick heavy loaves as the best I could expect. The bread I made wasn’t worth the effort so I gave up. Inspired and buoyed by the results from my recent attempt into the sourdough bread world using 100% spelt flour I’d now like to debunk the myths attached to the notes of caution I mentioned above. Spelt bread, slowly fermented using an active spelt sourdough starter, and baked under the right conditions will produce a loaf comparable to any artisan sourdough wheat bread. The crumb will be moist and open, the crust thin and crisp, the flavour slightly sour but with a deliciousness nuttiness not found in wheat bread. My dough is not super wet and there is no fancy footwork on my part during the kneading process. In the short space of time since I wrote the post “Breadbaking Tips for Beginners” my 100% spelt sourdough loaves have leapt way ahead in quality thanks to a change in my fermentation regime. I was happy with my loaves 2 weeks ago, now am over the moon. I have to thank Sarah @ Say! Little Hen for her guidance with timing and a flare in my arthritis for the change in the way I handle the dough. Converting your sourdough wheat starter to spelt is simple. The proportion of wheat will diminish significantly with each bake if you only feed the starter spelt flour and bake with spelt flour. I kept a small portion of active wheat starter aside for a few months as insurance until my spelt starter was able to prove it had longevity and resilience. I had been advised that the proteins in spelt flour may not keep the starter active. While the starter usually needs 2-3 feeds to make it intensely active in preparation for baking, it has proved to be resilient. If your starter seems sluggish, keep feeding it every 4 hours or so with 1/4 cup each spelt flour and filtered water until it becomes very bubbly. If you need to leave it overnight, feed it a cup of spelt flour and a cup of filtered water and that will keep it happy until the morning when it will be ready for use. Take 160g of stored spelt starter, mix in 1/4 cup spelt flour and 1/4 cup filtered water. Cover the bowl and leave the it in a warm place for 2 hours. Small bubbles will begin to form on the surface. Whisk in another 1/4 cup spelt flour and 1/4 cup filtered water, cover and leave to rest for another 2 hours. The starter will look aerated by the end of this time which indicates it is ready to use. Set aside 160g in a covered container in the fridge for your next baking session. Feed it 1/4 cup spelt flour and 1/4 cup filtered water every week to keep it alive or alternatively bake bread every week. 8-9pm Measure the ingredients into a large mixing bowl in the above order. Mix to a shaggy dough, cover loosely with plastic and put in the fridge for 20 minutes. After 20 minutes, tip the dough onto a well floured bench and knead it just enough to bring it together into a smooth ball. Stretch the dough into a large thin oblong then fold it in 3 in both directions. Lightly oil the bowl, add the dough, turn it over to coat it in oil then return it to the fridge for 40 minutes. After 40 minutes, tip the dough onto the bench, but don’t use any flour this time. Stretch the dough into a large thin oblong, then fold the dough in 3 in both directions. Return the dough to the fridge overnight. The next day, remove the dough from the fridge, tip it onto the unfloured bench then stretch it into a large thin oblong. Fold the dough in 3 in both directions, then fold in 3 again so you have a tight thick sausage. Place it join side up in a well floured (rice flour) bannetton and leave to rise, loosely covered for 1 1/2 – 2 hours. My kitchen is about 25C most of the day even when running the aircon. After 1 1/2 hours, preheat the oven to 225C. When the oven reaches temperature, tip the dough onto a sheet of baking paper and if you like, spray it with water, sprinkle with seeds, or else just slash the top of the loaf with a serrated edged knife. Lift the loaf on the paper into a covered roasting pan and bake at 225C for 20 minutes. Reduce the oven temperature to 180C and remove the lid of the pan. Bake for a further 25 minutes until the loaf is golden brown and sounds hollow when you knock on the crust. Hi. Have baked bread for years and now after retirement am taking it up again with sourdough. I now have your spelt dough in the fridge slow fermenting. I’m in Melbourne where it’s cold. When I take it out for the final rising, can I prove it in the oven at 30 degrees for the 1 ½ hrs? No it’s still there – if you are 🙂 Due to take it out in 4 hours to rise for the 1½ hrs and then bake. Hi Peter, I’ve been working on streamlining my baking regime so it fits more neatly in my day and have discovered that the dough is very tolerant. I presume you haven’t yet shaped your dough. If this is the case, yes, once shaped it will need 90-120 mins further proofing although you will need to keep a close eye on it at 30C because the danger is it will overproof. I’d probably bake it after an hour. Oven bounce seems to be greater if the dough is still on the rise. Hi, can someone please help me with this recipe. Sourdough spelt is the only bread I can digest. I live in Belgium, not warm, and I would love to bake my own bread. – How much is a cup in grams? Is it the same for flour and water? How much does it has to rise after those 4 hours? For the bread: if it is around 21 Celsius , do I need to keep it in the fridge between the stretching sessions? Do you know what I need to change if I use half white flour, and half wholemeal spelt. Very glad I’ve found this, hoping I will succeed…..
HI Gerd I hope I can help. The flour and water used to feed the starter should be equal whether you weigh in grams or measure in cups. 1 cup (250mls) is roughly 250g. Yes a warm place is best for activating the starter but it’s not temperature dependent. It will take a longer at a cooler temperature. You can encourage the starter by putting it in a container in warm water. The starter will have lots of bubbles on the surface when it is active. Some starters rise, others do not. With the bread dough, keep it at room temperature during the handling period. I have modified my method and now allow it to double in size at room temperature before shaping and resting it in the fridge overnight. Hi Ingrid, I was lucky and received dried sourdough starter flakes from a friend. I’m on holidays at the moment but will happily send some dried spelt starter to you when I return home at the end of the month. Meanwhile there is a worthwhile closed FB group worth joining, Sourdough Baking Australia & New Zealand. There is years of sourdough baking experience there, and someone is always willing to help. I followed this recipe to the letter and the last at was only part cooked. That must be disappointing for you. It reflects a difference in our ovens. You will need to adjust your baking time to suit your personal conditions. I felt the oven temp given was too low. I will now try it out of a baking pot and in a tin. I think, as per my rye sourdough, I’ll get the oven hot at the hottest, then reduce it to 210ºC and cook for roughly 1 hour. Does that sound sensible to you? Spelt bread can be baked as in the same tempertures as wheat bread. What is written in the recipe works for me every time, 225Cfor 20 minutes, then 180c for 25 minutes. As I am not familiar with your baking conditions I cannot judge how your adjusted estimates will work. One question, what material is your covered roasting “pot” made of? Hi, thanks for the advice. The covered pot I used is enamel ovenware. The oven is electric. I bake a lot, usually following recipes from various sources, and it’s always reliable so I’m scratching my head over this one! Clearly the recipe works for others so I can’t work out what went wrong for me. I’ll try it at wheat bread temp, in an uncovered bread tin, and report back! Is the pot cast iron or tin? The pot is fully enamel. Hi I notice you have use a high percentage of starter in this recipe… is there a reason behind this or just your preference? Hi Jemima, yes my percentage of starter is high compared to the average wheat flour recipe. I’ve found it to be the most reliable formula using 100% spelt. Hello Sandra, I would love to make my own spelt sourdough bread & would love some of your starter! I live in US,NH is it possible to mail it I am glad to pay! I use different types of flour for my breakfast loafs. Like Spelt, BrownRice, Oat, Almond, Amaranth, WW, Coconut. & Zucchini & Carrots an for fruit orange, cranberry, blueberries. I freeze the muffins & little loafs😊 Now I would like to try my hand at my favorite Sourdour Spelt, love it but not the $ for a loaf. I am new at this,like to experiment pray I do not mess up! Thank you for the knowledge hope I use it wisely! This was a delicious terrific bread! Thank you! The next time, I doubled the recipe, starter and all, and ended up with a terribly sour bread. Where did I go wrong? Hi Aron, The chemical reactions in fermentation that determine sourness are quite complex and I’m afraid I can’t give you a specific answer as to why one loaf was sweet, the other sour. The information on the link might help. Good luck. I think congratulations are in order, Sandra. Your loaves are beautiful and the crumb looks great! You’re to be given credit for sticking with it until you get the results you wanted. I, too, love my bread, though, so I can understand the motivation. I’ve a recipe for “regular” bread that, once mixed, is kept in the fridge for up to a week. It allows me to make a small loaf every other day or so, rather than 1 or 2 large ones that will go stale before I can finish them. Again, congrats! Thanks John it’s been worth the frustrating journey. Baking a small loaf every other day would suit me too John. I looove fresh bread. Thanks Sarah, I’m totally hooked, the overnight fermentation has made an enormous improvement to the quality of my bread. White spelt is still quite mealy compared to white wheat flour and the flavour is quite nutty, sadly I found the fibre in the wholemeal spelt a bit aggressive for my dodgy gut. I have begun to think about hot X buns, have you tried using the starter to make sweet buns? The recipe is written with rapadura but you can of course use whatever sugar you prefer. Wonderful post!! We are at the heavy brick stage with our rye sourdough and I am not sure what we should be doing different. okay…thanks! I will try a few of these suggestions. hello, so excited to read your post about spelt sourdough and would absolutely love a starter! Send me an email, you’ll find the address in contacts, include your postal address and I’ll send some dried starter flakes. wonderful but I’ve not yet found the ‘contact’ tab – perhaps I’m using man eyes – help! The slow overnight proving of bread in the fridge is one that I also recommend for all sorts of bread as it improves the flavour, as well as making it more digestible, A few years ago I had a discussion with a baker from St Andrews, who studied sourdough baking and practised it in San Francisco for 12 years, who felt that long overnight proving was a definite plus in a bread’s digestibility due to the chemical changes that take place. For those who use yeast in pizzas and other breads, overnight proving in the fridge, up to 24 hours, also makes the dough more digestible. Thanks for the recipe. I am about to do one separate tub of converted spelt starter to see how it goes in my life. The recipe differs quite a lot from my proportions, with more starter and less water, so it will come in handy. The method, otherwise, its the same. I also give my unspelted starter three feeds and end up with loads of the stuff. ( hence pancakes).Three feeds makes it very happy. Shall do a conversion this week. Thanks for the tips, I too have been discouraged by all the artisan bread books out there. My house is usually a lot cooler, around 68 F (20 C), so I’ve had to do a lot of adjusting of the proofing times. I just kept thinking as I read those books, “speak plain English!” Hope your bread is working out…. So excited to see this post. I may have to pick your brain, if you don’t mind! Totally inspiring reading Sandra. Super result. Thank you for such a comprehensive post! It’s wonderful to benefit from all your hard-earned knowledge and it makes sourdough bread seem a lot less mysterious! So glad you finally arrived at the perfect 100% spelt sourdough – a long road, but so worth it. I, too, have had to start putting the dough in the fridge to slow down the fermenting as Athens is SO different from the cool UK, even in winter. And, like you, have found that the quality of the loaf (even though I use conventional – local – wheat flour) is far superior and bakes beautifully. Debi I’m so excited about my bread, I can’t believe how “professional” it is. Slowing the fermentaion made a significant difference. Enjoying the delicious loaves may have added a kilo or two…. My daughter in law finds she can’t tolerate ordinary bread. I wonder if spelt bread might satisfy her yearning for this staff of life? I’m going to give it a try, I like the whole process involved in bread making. You deserve loads of praise for your perseverance, Sandra! Those loaves are amazing. My starter arrived today and I’m shopping for ingredients tomorrow. Unfortunately I got rid of my covered roaster a year or so ago so will have to try and find another one. We leave a week from tomorrow for a short trip to Melbourne then are back a week and leave for four weeks, so I’m not at all sure I should embark on this adventure yet, but will see how I go. Congratulations, you’re a legend! 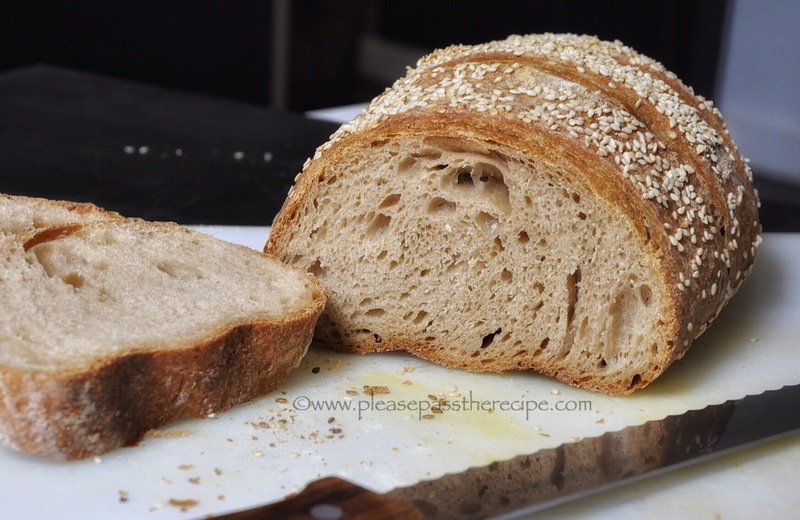 This entry was posted on February 18, 2016 by ladyredspecs in Baking, bread, Breakfast and Brunch, FODMAP diet, Food and tagged 100%spelt sourdough, bread, Fodmap, FODMAP diet, low fodmap, sourdough, spelt.